Al Jazeera to broadcast UN leaders' debate. 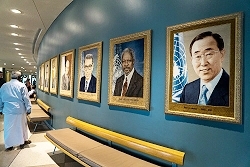 New York, July 2016: Ten candidates for the position of the next UN Secretary-General will be taking part in the first-ever internationally televised live UN leaders’ debate titled: “Leading the United Nations: A Global Town Hall with UN Secretary-General Candidates” on Tuesday, 12 July 2016. Al Jazeera Media Network (Al Jazeera) will be broadcasting the event on all its platforms in partnership with the President of the UN General Assembly, H.E. Mogens Lykketoft. This year, UN Member States and the people they represent will have the opportunity to ask their questions directly to the men and women competing to become the next UN Secretary General. Al Jazeera English correspondent Mike Hanna will present the 30-minute, pre-debate show, beginning at 18:00 EDT. Al Jazeera’s James Bays and Folly Bah Thibault will moderate the Town Hall debates from the UN General Assembly Hall in front of a live audience including diplomats, observers, civil society, and UN Staff, among others. It begins at 18:30 EDT. The ten candidates will be split into two groups and take part in two separate debates consecutively. The first group will compromise of the Deputy Speaker of the Croatian Parliament, Vesna Pusić. António Guterres, the former Portuguese Prime Minister who also served as a United Nations High Commissioner for Refugees. Susana Malcorra, the current Foreign Minister of Argentina, Vuk Jeremic, the former Serbian Foreign Minister and Natalia Gherman, the former Deputy Prime Minister of oMoldova. The next five candidates who will be taking part in the second debate will be Helen Clark, the former New Zealand Prime Minister and current Administrator of the United Nations Development Programme (UNDP). Danilo Turk, the former President of Slovenia, Christiana Figueres the former Executive Secretary of the UN Framework Convention on Climate Change (UNFCCC), Igor Lukšić, the Montenegrin Foreign Minister and Irina Bokova who is serving as the current Director-General of UNESCO who is originally from Bulgaria. As the selected broadcast partner of the UN, Al Jazeera will broadcast, stream and report on this historic event across its global broadcast and digital platforms on Al Jazeera English. Al Jazeera Arabic, Al Jazeera Mubashar and Al Jazeera Balkans will also broadcast the event. The debate will be carried on all digital (including mobile) platforms of Al Jazeera English including being live streamed on Youtube.com. Al Jazeera will also offer the live feed free of charge to UN Television and other media carriers throughout the world. There will also be a special landing page on www.aljazeera.com/UNdebate which will host articles, opinion pieces and interactive features ahead of the Town Hall. During the debates the site will also live blog from the event and engage on social media platforms. Al Jazeera journalists will also shoot and post a range of photo and video content as well as in social media. People watching are also encouraged to tweet their questions and comments using the hashtags #AJUNdebate and #UNSGcandidates. Commenting on the debate Giles Trendle, A/Managing Director of Al Jazeera English said: “We are delighted to partner with the President of UN General Assembly to broadcast this historic event. Al Jazeera’s mission is to inform and hear the human story giving a voice to the voiceless and empowering them with the information and knowledge that impacts their lives.